There are so many things in our lives that Pinterest has made better. I love being able to search for quick and easy ways to clean things and I’ve gotten more than a few ideas on how to decorate our house. But Pinterest isn’t always great for everything. No, Easter didn’t have my family planting jelly beans Saturday night to awake Sunday to find that lollipops had sprouted. I don’t make snacks for my child that include elaborate fruit skewers carefully color coordinated so that when they are displayed they resemble a rainbow nor does he take lunches to school that resemble bento boxes that have his favorite characters cut out of cheese. Our Elf on the Shelf is pretty basic in his mischief and we don’t make handprint (or footprint) crafts for every holiday. And I’m okay with that. And you should be, too. Pinterest is making parenting much harder than it has to be. You ARE NOT a bad parent if you don’t do these things. Trust me. Believe it or not, I survived nearly 33 years without a magical elf appearing every Thanksgiving to help me celebrate Christmas (I bet you did, too) and a plain old peanut butter and jelly sandwich filled me just as well as any cookie-cutter shaped cheese could. We’re setting unrealistic expectations for ourselves and therefore setting a standard for parenting that many of us can’t continually achieve. Scratch-made birthday cakes in tie-dyed colors and elaborate styled photo shoots won’t make our kids remember their birthdays any more than a few snapshots and a grocery store birthday cake will. Relax. We’re all making this too hard. I’ll admit I’m a bit guilty myself. But our kids need love and attention, not bells and whistles. An afternoon spent playing with trucks in the mud, having a tea party, or playing in the sprinkler is just as important to them as time spent in the over-the-top tee-pee you constructed out of reclaimed wood pallets. And trust me, store bought play dough is just as fun as homemade – and it’s a lot less time consuming. There’s no expectation for you to be a Pinterest-perfect parent. Your kids don’t expect that of you and you shouldn’t expect that of yourself. 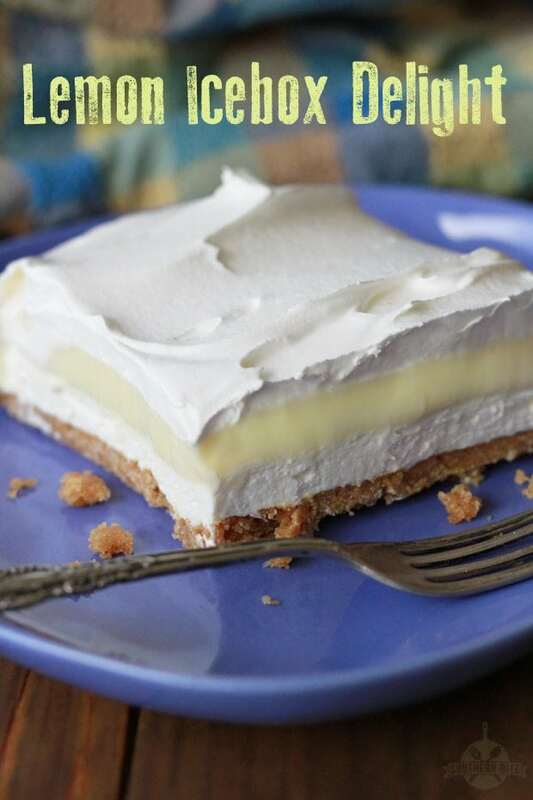 Y’all this Lemon icebox Dessert is one of my most favorite Spring and Summer desserts. My Mom got this recipe from a very sweet lady named Deborah Hollon and she’s been making it for years. 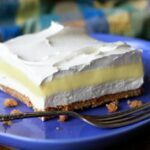 It’s got all the great flavor of a Lemon Icebox Pie, but the crust is what really makes it special. It’s almost toffee like. It’s really amazing! Y’all enjoy! Preheat the oven to 350°F. Combine the graham cracker crumbs, butter, and sugar in a medium bowl. Press the mixture into the bottom of a 9x13 glass baking dish that has been lightly sprayed with nonstick cooking spray. Bake for 12 to 15 minutes or until just bubbly. Cool completely. Mix the cream cheese, powdered sugar, and 1 container of the whipped topping until combined. Spread it over the cooled crust. Whisk the sweetened condensed milk, egg yolks, and lemon juice together until combined and slightly thickened. Pour the mixture over the cream cheese layer and spread to the edges. Top with the remaining container of whipped topping and spread to the edges. Refrigerate at least 4 hours, but preferably overnight, before serving. LOVE this post Stacey! Amen and Amen again! What’s the point of spending 5 hours on cake and decorations when that time is better spent actually being with your child and having fun. Agree with all of this. And we all know your Momma has the best recipes. Definitely going to make this one! Thanks, Brandie! I really think it is the truth. We’ve got enough coming at us as parents. There’s no need to create more work and stress for ourselves. Great thoughts 🙂 I totally agree. I will still find myself pinning lots of kid stuff that I’ll probably never have the time, money or energy to do. I’m so lost…when did elf on the shelf become a thing ? I think I will skip out on that and stick with the old school traditions. I don’t want to give my family raw egg yolks, but there’s no cooking of the filling shown. is it okay to cook the filling? I would not cook the filling. I suppose you can simply leave the egg yolks out. I would imagine that would work, too. I’d just leave the egg yolks out altogether if there was a concern. Thanks so much, Marsha! Another option would be for the person who doesn’t want to use raw eggs is to use “pasteurized eggs” instead. I know they’re considered “safe” to eat (not exactly sure why) when a person is worried about consuming raw eggs. I’ve used them before, and they work great! I thought your’e not supposed to eat raw eggs, but this recipe uses raw eggs. It’s a personal choice. There is some risk involved with eating raw eggs. However, my family and I have been eating raw yolks in ice cream, lemon icebox pie, and other desserts like this forever and we’ve never gotten sick. You just have to decide is it’s something that’s okay for your family. Regardless, you can simply leave the egg yolks out of this recipe. Love the pie recipe! Well said Brandie and Ali! As a grandmother, you look back at your children’s birthdays and you are not going to get an award from them for having the best decorated cake, elaborate decoration, or how many pinterest ideas you created. You are going to get a hug and I love you for spending time and being in their world while they grow up. Kids invite you into their world when they see you want to spend time with them and not money. they let you in their world. Never have been a fan of the “Elf On The Shelf” trend. ha ha! You have the right idea Stacey…. First, the link to get here didn’t work. 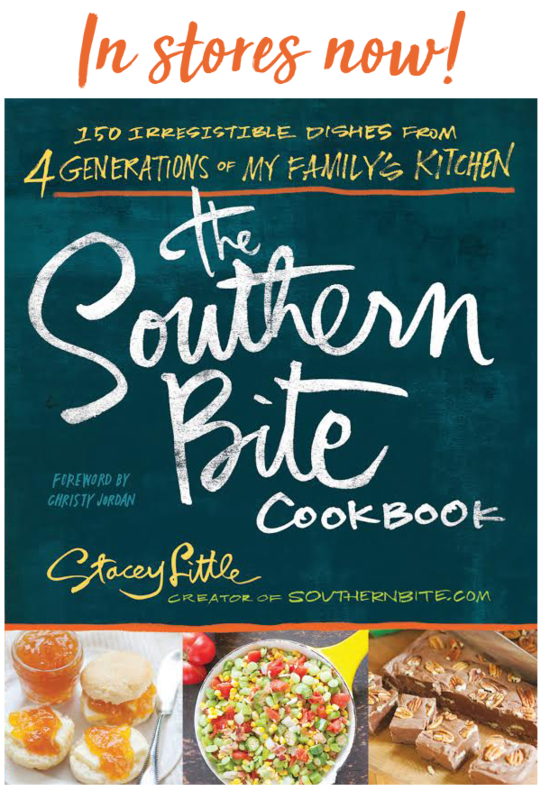 I had to search for Southern Bite to find the ‘rest of the story’ and the recipe. Second, I had to laugh when you said store-bought cakes are all right. My kids always preferred them. Their attitude seemed to be any mom can make a cake, but one that cares actually spends money on the cake. Sigh. Stacy, that’s a WINNER. Yummy, Delicious & Practical! My family loves it!!!! Hi. The lemon juice cooks the egg yolks. Yep. It is true. Stacey, I know what you mean about trying to keep up with the Jones-es. One of them I ain’t as i refused to pay $150 for graduation announcements (only 25 cards) so we made them, I refused to pay $500 for senior pictures so we took them. My daughter and I went out in the country where there were some old barns and stuff and got some beautiful picture and had a ball spending the day together getting them done. Those memories are worth so much more than getting it all made professionally. So I agree with you our time spent with our children is worth so much more than trying to be a perfect parent. A perfect parent gives their child time, and unconditional love not everything made perfectly like others might do. You are so right. Those memories will be far more special. Thanks for sharing, Marsha! Hi Dee! Are you talking about the social media bar on the left for Pinterest, Facebook, Twitter, etc? What type of device and browser are you using? what is frozen whipped topping??? From Ireland and never heard of it…..
hope this helps and have a lovely day! Great post Stacey! And this dessert looks delicious! I had such high hopes for this one! But when I read that it not only has one, but two containers of homogenized vegetable oil with high fructose corn syrup in it, I got disappointed. My kids are never touching that ****. Hey Amy! First of all, thank you for your comment. I did edit it to remove language as this is a family friendly site. Secondly, homogenized is actually a term used when two liquids are mixed together, wherein both of them are insoluble (meaning they won’t stay mixed). By homogenization, one liquid is made into much smaller particles in order to allow them to stay mixed with the other. Most often, this is stated in reference to milk, that is often homogenized so that the cream doesn’t rise to the top but rather stays uniformly dispersed throughout. As far as not being a fan of homogenized things, when it comes to milk, I’m totally with you! I drink it homogenized but non homogenized milk is amazing, especially when you have to cut through the cream in the top with a butter knife before giving it a good shake – Delicious! However, I believe the term you likely meant to use here is hydrogenized. Hydrogenation is a chemical process that causes liquid oils (fats) to become semi solid or solid fats. While you had the terms confused (but hey, they both start with an H! ), you are correct in stating that this recipe does call for two ingredients that are hydrogenated. I’m glad you have set standards when it comes to your children and parent in the best way that you can based on the knowledge available to you. While I have never suggested folks subsist entirely on any dessert dish, I’ll make up the difference in my house by serving this on certain special occasions, keeping my language in check as I go about my daily life, and making sure my son has all the help he needs when it comes to chemistry homework. Thanks, Dianna! I hope you’ll enjoy it! I don’t know where you’re from, Amy, but most grocery stores carry non-hydrogenated/non-high fructose corn syrup whipped topping nowadays, if that’s a PERSONAL concern to you. The brand my grocery store carries is called Truwhip. Or, you could just pass over the recipe because you don’t want to make it for whatever PERSONAL reason you have. Adult in support of adults making their own food choices without having other adults treating them like children and chastising them for their food choices. Have a wonderful day, Stacey! Keep sharing hydrogenated corn syrup filled recipes with us. We are more than capable of making substitutions if we wish, without having to be told…thankfully, you already knew that. Thanks for the chuckle, Susan! Thank you, Susan, for an honest reaction. My food choices don’t always meet everyone’s approval, but the key to civilization is being able to tell and tolerate the difference in MY choices and others. 2, Those who don’t like a certain food and don’t want anyone else to eat it either. The first group quietly exercise their American right to free choice; the other group denigrates the food and the people who do like it. This holds true for all sorts of choices, even books, TV shows, social commentary – you name it. I really loved your post, I wrote something similar not long ago for the blog I work for. I am glad to see that more and more parents are realizing that while social media (and Pinterest) have made our lives easier in some ways, it also creates standards that we simple should not attempt to keep if they make us feel inferior (or crazy). 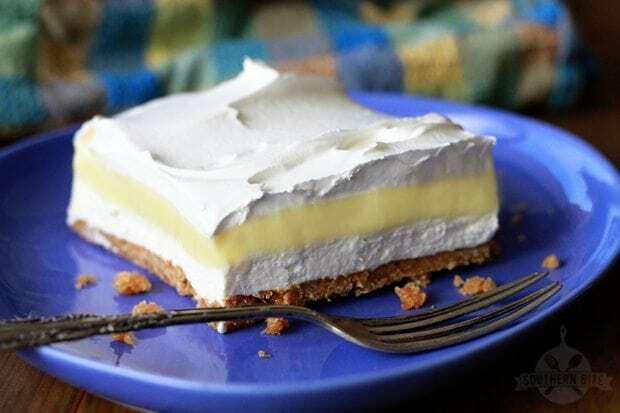 I can’t wait to try this Lemon Icebox this summer, lemon desserts are my favorite. Thanks, Samantha! I hope you’ll enjoy it! I will be making this for Mother Day. But I have to tell you,I brought your cookbook and I can’t put it down.! I have to read the whole book. I just love it!!! Keep writing!!!! That’s wonderful! How flattering! IU’m so glad you are enjoying it! It’s a good reminder to not make parenting a competition. My children are older. The oldest two are already out and on their own. I remember though, when I was a young mother, being a member of several moms support groups. Sadly, each time, they devolved into being competitive, so, I left, never to join a mother’s support group again. I realized it was my decision whether, or not, I was going to allow myself to remain in an environment that did not truly support me, but instead made mothering a competition. I had absolutely no desire to put such unrealistic and stressful expectations on myself, nor would I allow others to do that to me, so I removed myself from those types of environments. I rarely ever use Pinterest. I’ve heard about this competitive nature happening with Pinterest, but I have never experienced it personally because I don’t allow myself to get sucked into that type of thing anymore. I have learned from my past experiences how easy it is for people to lose focus on what really matters, and lose what really matters in the process. It’s not worth losing peace of mind and contentedness in exchange for being overwhelmed, unsettled, and anxious trying to do things according to outside pressure. It’s best to do things in a way that is reflective of who you are, and is in tune with your life, family, and personal priorities. If you don’t respect that balance, life can quickly become absolutely chaotic, bother internally and externally. I know people will sometimes claim that they are only trying to become the “best” parent they can be, in their quest of spiritual improvement, but with the pain of stretching and growing spiritually, God’s presence provides peace and calm in the midst of that growth, despite how painful it may be, not chaos and anxiety, because God does not ask us to become what we are not, but to become who we are in Him. Even if one doesn’t believe in God, this is still true. These are things I’ve learned over the years. I just thought I’d put it out there for whomever it might help. I hope you don’t mind. I don’t mind at all, Susan! You are so right. Parenting should never be a competition. Thanks for sharing! OK Stacie, help me out here. I’m making the Lemon Icebox Delight and so far so good. I just made the 3rd. layer which is the lemon juice, sweetened condense milk and egg yolks and whisked it all together. It is thick as syrup and my question is Will it thickened up more after I pour it on and then add the last layer of cool whip and then refrigerate overnight? It just seems like if I were to cut it now the lemon layer would just run out everywhere. So what keeps it from doing that 4 hours later or overnight? Let me know as soon as you can or anyone else out there who knows the answer. This is my first time making anything like this, can you tell? The lemon juice helps to thickens that layer and will continue to thicken the longer it sits and cools. Good luck! Hope you enjoy it! Hi Stacey, thanks for getting back to me. I went to cut a piece early this morning for a friend to take to work with her when she dropped off my dogs girlfriend for a play date. First of all the flavor was great (of course I had to taste it before giving her a piece) but was disappointed that the crust didn’t come out of the glass dish. And yes I did use Pam in the glass dish before putting the crust in. I baked it for 11 minutes because my oven runs about 7 to 10 degrees hotter than what it is set for. I finally used a butter knife to get the crust out and it was delicious but not pretty. I’m hoping when I take out another piece to serve that it will come out nice since I have the first piece out. Can you think why this would have happened. I have used graham cracker crust for other things I’ve made and had the same problem or it was too hard. I prefer a crust of any kind to be softer or not as crunchy I guess that is what I am trying to say. Anyway great tasting and I know my sister and I will enjoy it. 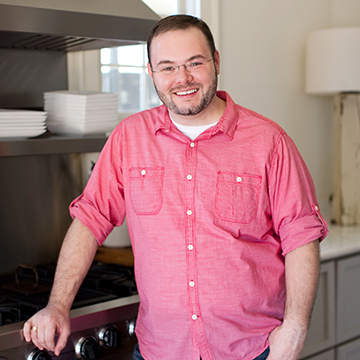 I can’t wait to try some of your other recipes especially some of the main courses. Love your site. Have a great day. The first piece of any dessert like this is always hard for me to get out with it still looking pretty. There’s such skill and finesse involved, it should be an Olympic sport! Hopefully the others will come out easier. This recipe should produce a crunchy crust, unlike lots of other graham cracker crusts. The amount of butter in the crust greatly affects whether the crust ends up soft and crumbly or more crunchy. Love this article! I am so shocked when I hear about parents spending hundreds or even thousands for a birthday party just to outdo the last part their child attended! You and Heather are definitely doing it right with Jack! Thanks to my father who informed me regarding this web site, this website is really awesome. Would it work to use two Store bought graham cracker crusts? Sure! But there’s something about the crunchy crust that just makes this dish! Just ran across this recipe today. And I love how you discuss the chemistry of food. I’ve hated to cook all my life (I’m 64) and I think it’s because I never learned the properties of food and their combinations. I’ve felt like a failed chemist. I can’t make any recipe without a photo, and the step-by-step instructions on Pinterest were designed with me in mind. I think it’s inborn in some people, and taught in the kitchen by grandmothers and mothers when kids are young. My mother always said, “Just get out of the kitchen and let me get this done.” Sad, but true. Anyway, I’m glad I found you, and keep up the explanations. Some of us still need them. Do you cook the 3rd step? No. The recipe doesn’t call for it to be cooked. Love your recipes! I have lots of lemon lovers at my house, but wondered what you would suggest if I wanted to substitute the lemon with strawberry or chocolate so we would have multiple yummy choices? I just made the pie. I did not like it. If you like lemon flavored sweetened condensed milk, then this is a recipe for you. I followed the recipe exactly, and I got a runny, messy pie. So sorry to hear that. It’s a classic recipe that’s been around for generations. It’s a favorite at our house for sure. Made this for a party this weekend. Many desserts there, but this dessert was a hit!! As a matter of fact I made two in three days because people liked it so much. I am 75 years old and bake often. I bake everything, that’s why I decided to bake this because it sounded so yummy. The second time I made this I made a more conventional Graham cracker crust only because I had difficulty getting it out if the pan. Either way, it’s good!! I had extra time so for the top I whipped up some whipping cream. Cool Whip on top or whipped cream……this dessert is a winner. Forgot to mention, I let it set up for 6 hours. Made it in the morning.